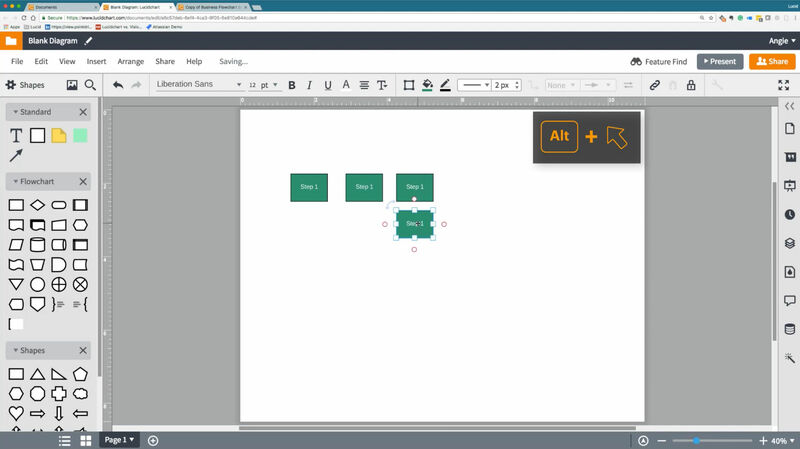 Lucidchart is a diagramming solution that enables you to create diagram more easily on any device. 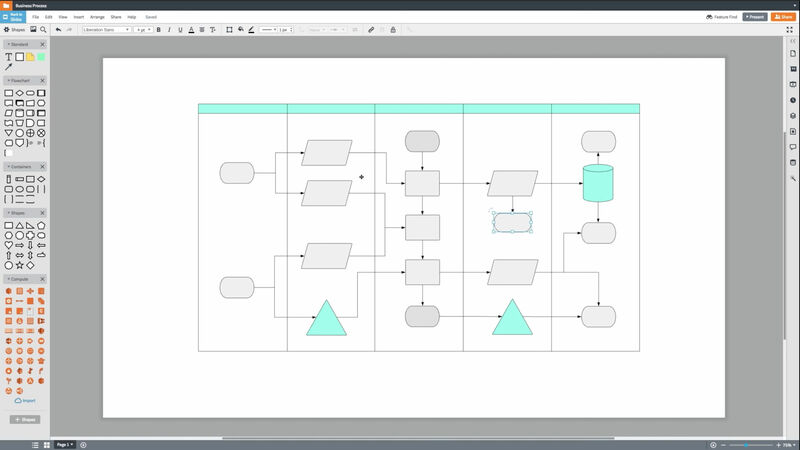 You can create a wide variety of diagrams, which includes simple flowcharts and complex technical diagram, and anything in between. Lucidchart enables you to use your own live data to create your diagrams, as well as to import data from a range of different sources that you already use to collect and store data. 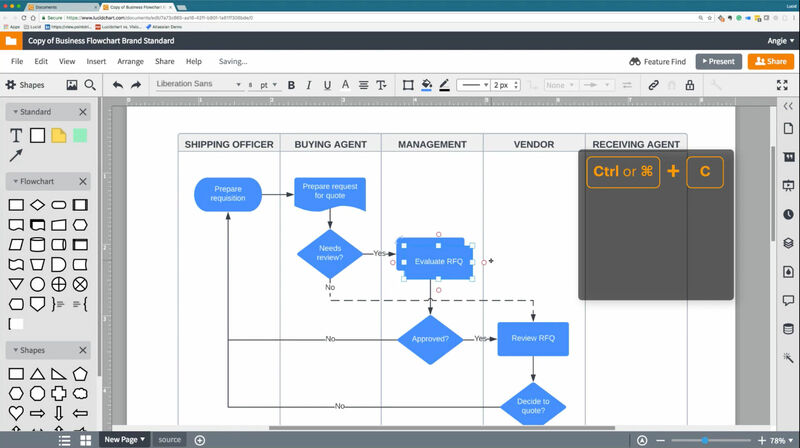 To create these diagrams, you can use Lucidchart’s drag-and-drop interface, or create more professional and integrate mockups and network diagrams.Lucidchart integrates with other leading productivity apps, such as Microsoft Office, Atlassian, and Google’s G Suite. It’s also accessible from mobile devices. You can manage user accounts, configure permissions, and auto-provision new accounts quickly so you won’t lose access to any diagrams when their creators leave your company. Lucidchart also allows you to give access to all users from one master account. How much does Lucidchart cost ? 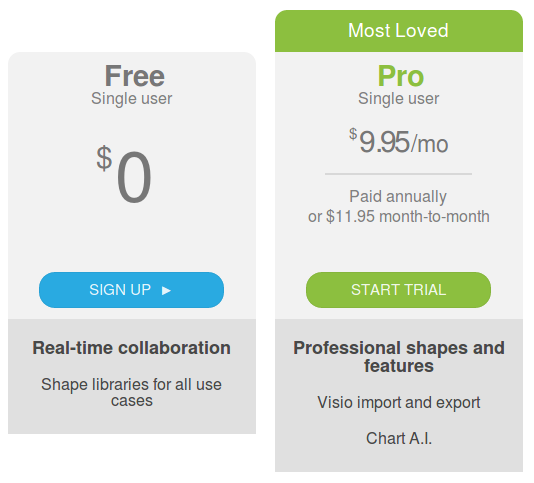 The pricing for Lucidchart starts at $9.95 per month. 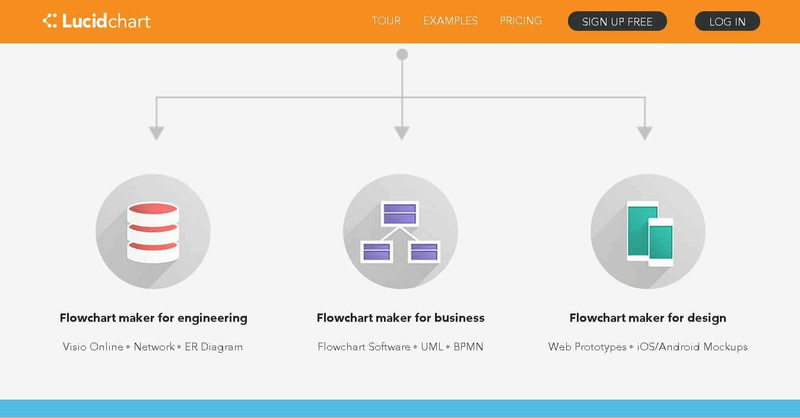 Lucidchart has a single plan - Pro at $9.95 per month. Lucidchart offers a Free Plan with limited features. They also offer an Enterprise Plan for their product. Shape libraries : Network Diagrams, Floor Plans, Organization Chart, and ERDs. LucidChart software offers Enterprise Pricing plan on basis of request. Contact the vendor to get the latest pricing detail. Disclaimer: The pricing details were last updated on 04/12/2018 from the vendor website and may be different from actual. Please confirm with the vendor website before purchasing. Pros: We use it to create roadmaps of how certain things should work, like user onboarding journey with all the possible steps and paths. I also love getting emails with gifts from them which let me create more documents in free version. Cons: A limited number of items per document in the free version but I wouldn't say that's a problem we face often. 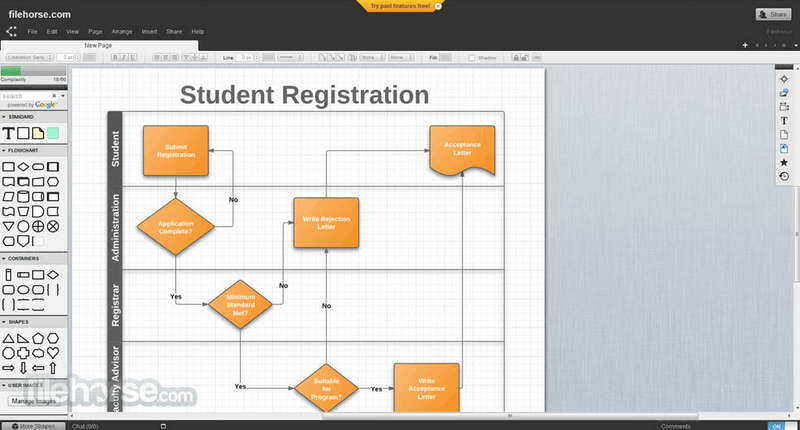 Lucidchart is a great option to create just about any diagram you need for game design! First, let me say that it is the first diagram and flow chart system I have ever used but that is only because I have never needed another. Lucidchart has a huge selection of pre-made templates for different projects from flowcharts to floorplans and everything in between. 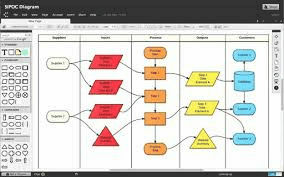 It's drag and drop interface allow for easy custom charts or modification of the premade templates. With the reasonable price plans available (including a FREE Plan) there is an option for you to get your own online storage which is great to keep all your charts and diagrams available online to access in a pinch, but if you need a chart or diagram download there are many different download options available including one of my personal favorites the .png format. It's worth mentioning that if you're a student there is a free upgraded account you can get. If you don't upgrade to a paid account you will not get much space to save documents but this isn't an issue if you just download them all, but again you won't have access to them at that point. Additionally, the site is slow loading the first time you log in but it's not too bad. Overall: In my game development business, I need a variety of different charts and diagrams. I have never had a need to find another way to make a chart that I couldn't make with Lucidchart. I can even use it to lay out massive maps for level development. I personally have never run out of available map space and I can make some pretty big levels. It is a great system for doing this because it even can handle building layouts and interiors as it has little furniture graphics that you can drag and drop to build out the level with visual content. For game design and development it is a must have tool in your arsenal. 2. People can create more different processes on the same sheet and share. Cons: 1. Sharing the created process with non- lucidchart user can be a hustle. When you send the document as an email attachment the viewer has to zoom in to see the images. Overall: 1. My department and I were able to map out a lot of internal processes using this software. Pros: Lucidchart strikes a great balance for a functional and beautiful GUI, like an old Office suite with rounded edges. I use it to create flow charts for customer-facing documentation where some visual help is required, and this does the job. I especially love how exporting automatically crops out the empty space with a reasonable margin. Cons: Occasionally there will be an arrow or connecting line that refuses to snap in place how I want, but I chalk this up to my own inexperience. 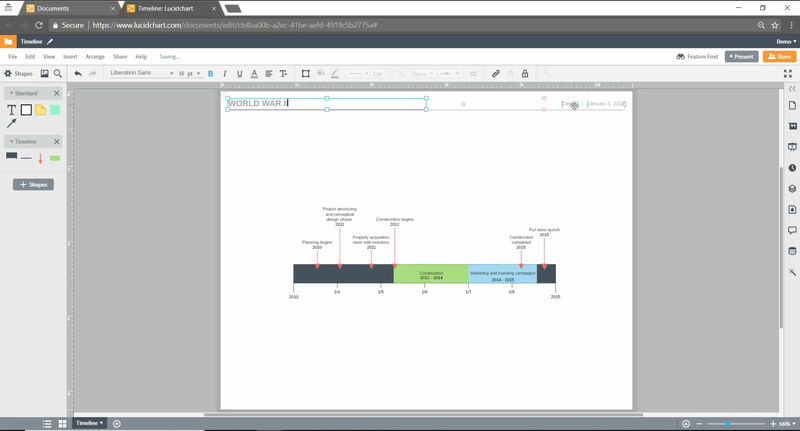 Overall: Lucidchart fills the need for visual documentation / flow charts used internally and externally. It's intuitive, powerful, and clean. No complaints whatsoever. Pros: The software is easy to use, responsive and does exactly what it says it does. Cons: I don't think most people will need Lucid Chart. Most simple things can be done in Word or Publisher but it is great for more advanced work. Like most flow chart software you need to know what you are doing and how it works to get the most out of it. Overall: I used it for a few simple charts and diagrams. I'd use it again but not sure with average needs I can justify the cost. Cons: Sometimes getting the correct image to upload can be a pain, but could also be something on our end. Pros: The ability to collaborate with others easily with your teams creations is very well executed. Cons: Templates are more scarce than on alternative programs. Overall: Positive experience, this is my goto tool for creating diagrams, flowcharts etc. Pros: The thing I like most about this software is that it is readily available online to use. It doesn't require any software installation or download. Another thing I like about it is that it offers the full version for students to use in university. The charts are also easy to navigate to find each different type of modeling figure. Cons: Although the software has many features, it is a bit difficult to navigate without instructions. The software was a self-learning experience for me.